The 5 samples come inside a cloth pouch. 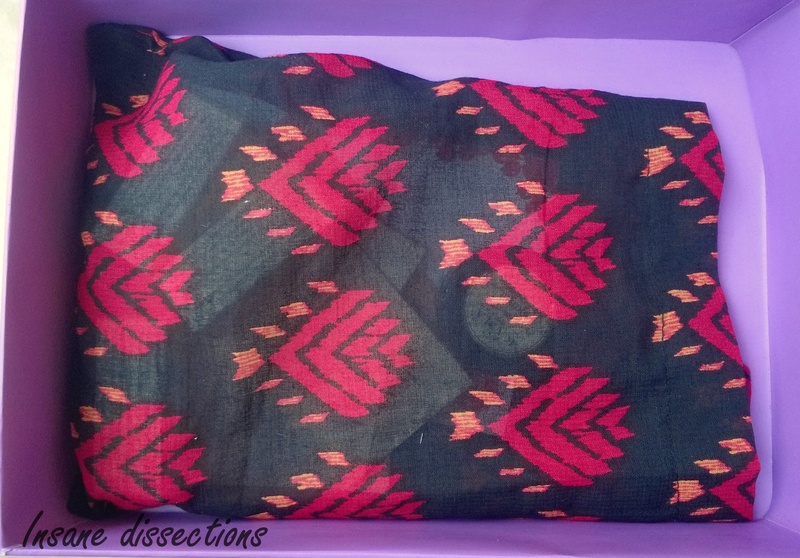 I have been getting the orange multi-colored pouch everytime but this month it came in a black pouch with red motifs. They gave 3 samples each 10 ml of this. You can give any fancy name but it basically is a Hair oil. 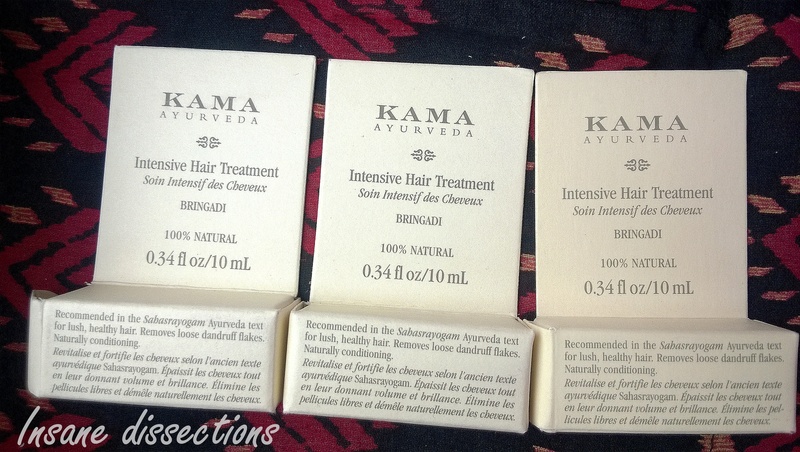 The 3 samples will last 3-4 uses on my waist length hair. I have used the sample once and it smells BAD. Not too bad that I want to throw it away in trash though. Most ayurvedic products smell this way. But I must say I saw a remarkable different in one use itself. I face a problem of hairfall every monsoon and this oil actually work wonders on that aspect. It is claimed to work on hairfall, premature greying and faster hair growth. Another product from the brand, this is a facewash of sorts- only in dry form. They have given a small tub and the quantity is not mentioned. It looks it will last me 3-4 uses. The product is in powder form which is to be mixed with water to make a paste and then applied on skin to remove dirt and grime. This one is fanciest of the lot. I have never tried this before and I am looking forward to using it. I got 2 sachets of 6 ml each of this product. This is a leave-in cream to manage frizz and dryness. It contains jojoba oil and conditioning guar gum to repair and control the hair. I have received few other products of this brand in past and they were okayish. 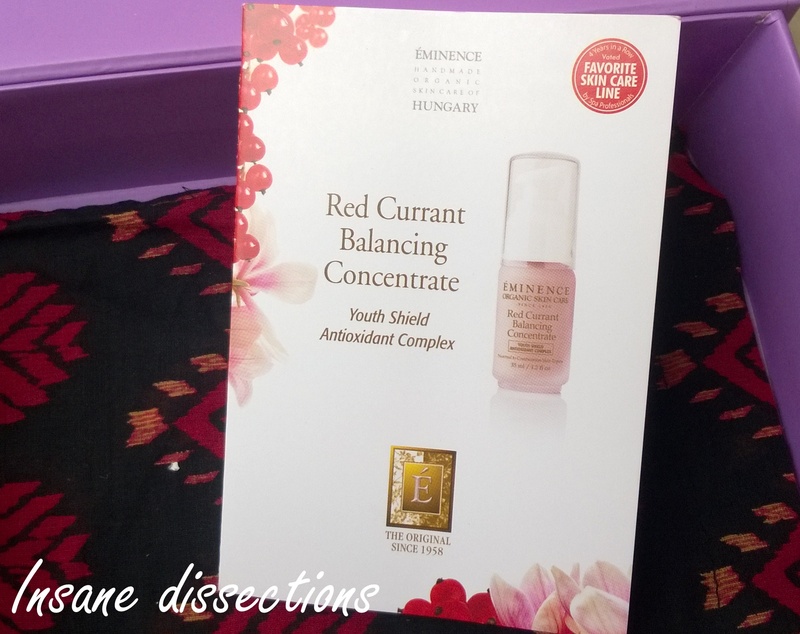 This one seems like anti wrinkle cream gel which gives improved skin texture, oil control and nice glow. The sachet is 2 ml in quantity. But I wouldn’t have been excited about this one even if I had got it. 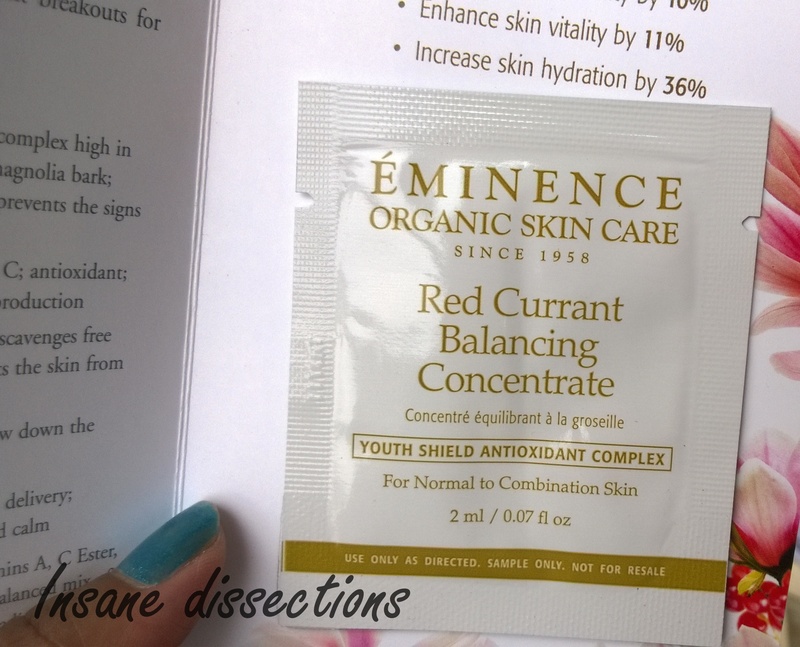 I received the same sample in my previous Envy Box and I didn’t like it. Though the sunscreen gives high protection, the damn thing leaves a whitish cast. The greasiness is another woe. 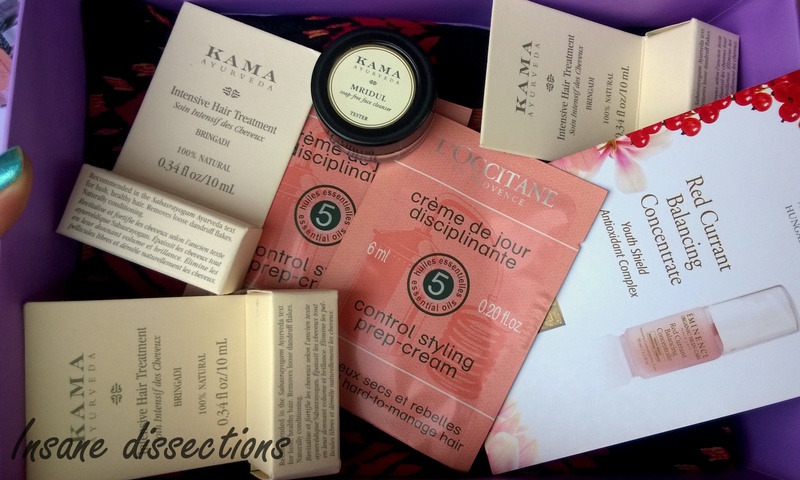 This month the sample size are decent especially Kama product. It was thoughtful of them to give 3 samples for oil. But I would have liked if it contained more of skin care products and some perfume sample. Last month’s Envy Box got me more excited. Plus the missing sample is not somethimg to look forward to. Anyhoo, I have mixed feelings for this one. Hope next month’s box is better. 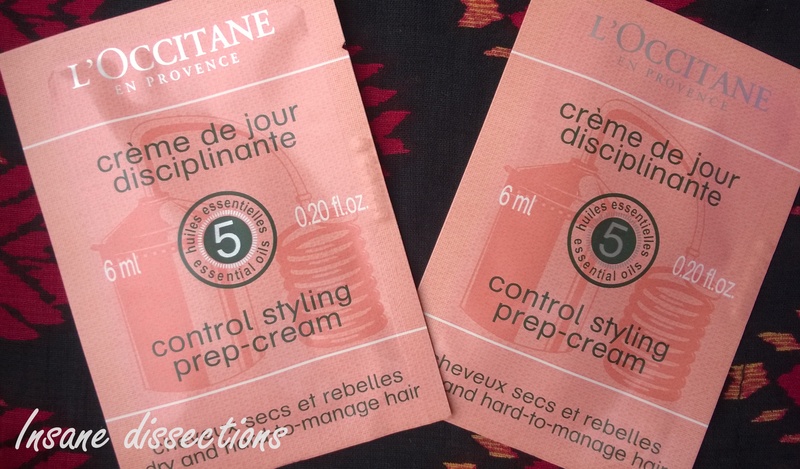 Also, more products of L’Occitane please! 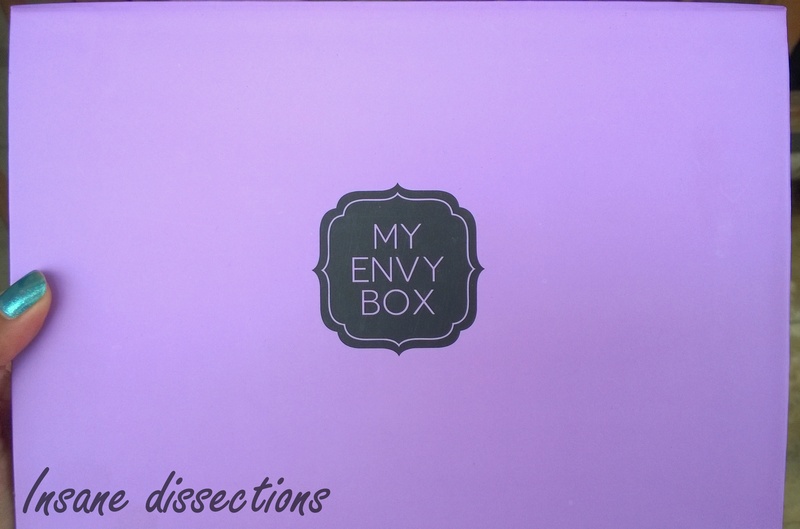 My Envy Box is an Indo-French luxury box service which contains five trial size beauty products from top international luxury brands and every month they send different products depending on the theme for that month. This month’s theme is lavender. I love the packaging. 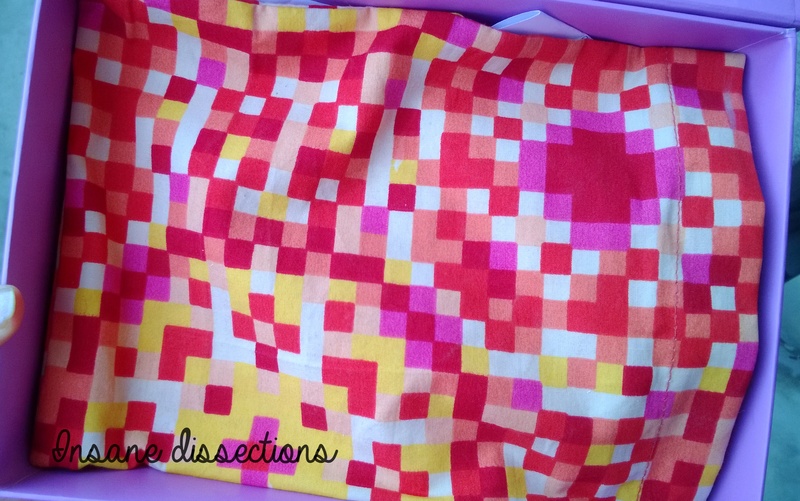 The products come wrapped in a cloth bag inside a beautiful and sturdy box with magnetic lid. The box itself will make you happy if you are getting it for the first time. This is a beautiful but difficult color to describe. Think of it as cross between grey and pastel blue and then pastel-ify it some more. The finish is glossy and goes opaque in 2 coats. This will work as a great base color for nail art enthusiasts. Me likes. Plus I didn’t have any grey color in my stash so this came at the perfect time. The product being full-sized is added bonus. 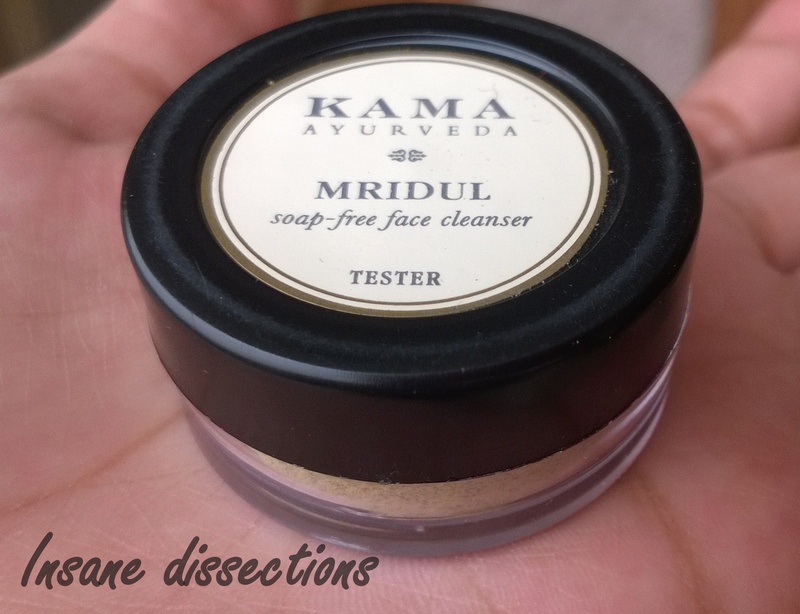 I have used the orange almond face scrub from this brand and I LOVE every bit of it. 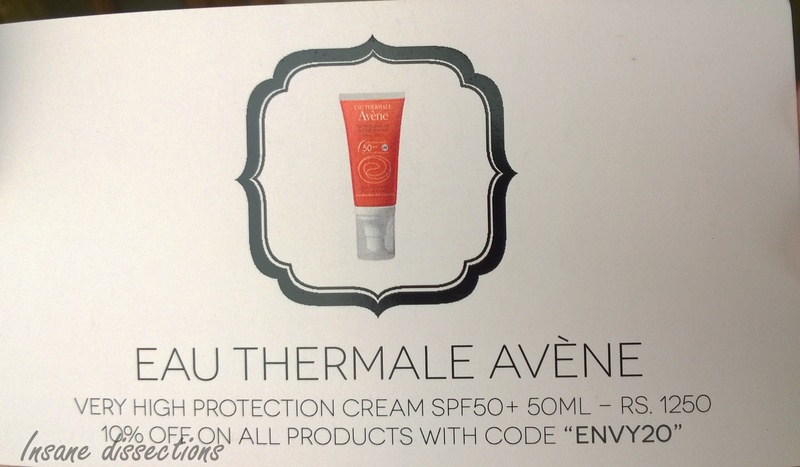 They gave it as a sample in April Envy Box. 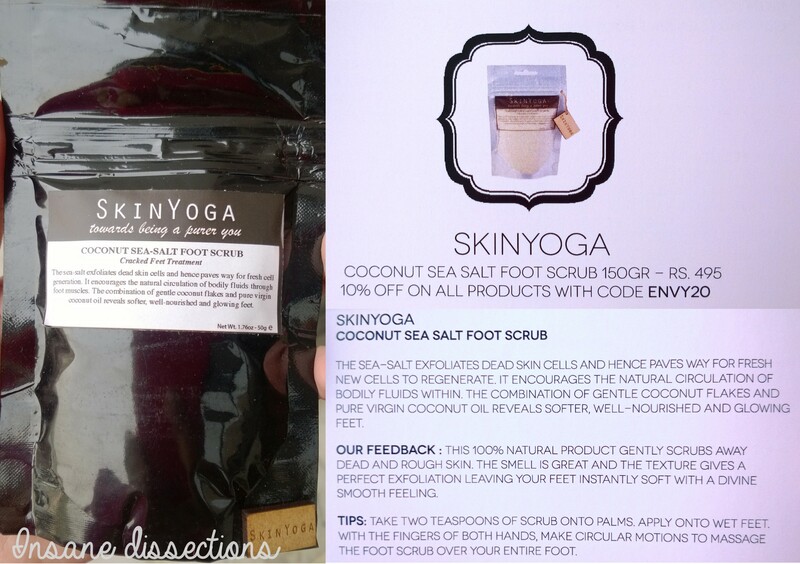 This Coconut Sea Salt foot scrub looks as promising as its brother and the quantity will last me easy 4-5 uses. It smells of coconut and you can actually see the coconut flakes in this scrub. This is a tiny tube which will last 2-3 uses. The texture is not gritty and it smells minty. Anything mint-fragrance has such cooling effect in hot Delhi weather. Lets see how it fares. This is a lavender body lotion and the quantity is decent for a sample. I don’t like lavender fragrance as such but I really like this one. 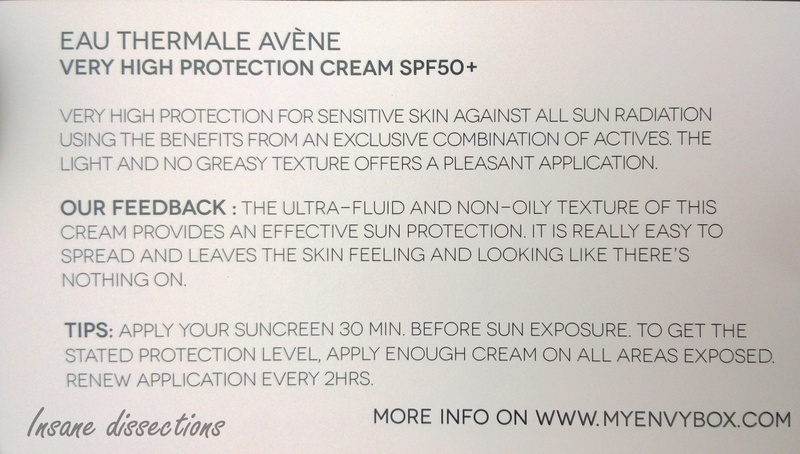 It is SLS and paraben free. It moisturizes my combination-dry skin pretty well. I always carry a moisturizer with me and it is the perfect size to fit in my bag. I have saved the best for the last. This is the star product in this box for me. The fragrance is Uh-may-zing. Perfect blend of fruity and floral notes. And did you see the packaging of the full-sized bottle. Total Loouuuv. Somebody gift me this perfume (Mr. A please take notes!). 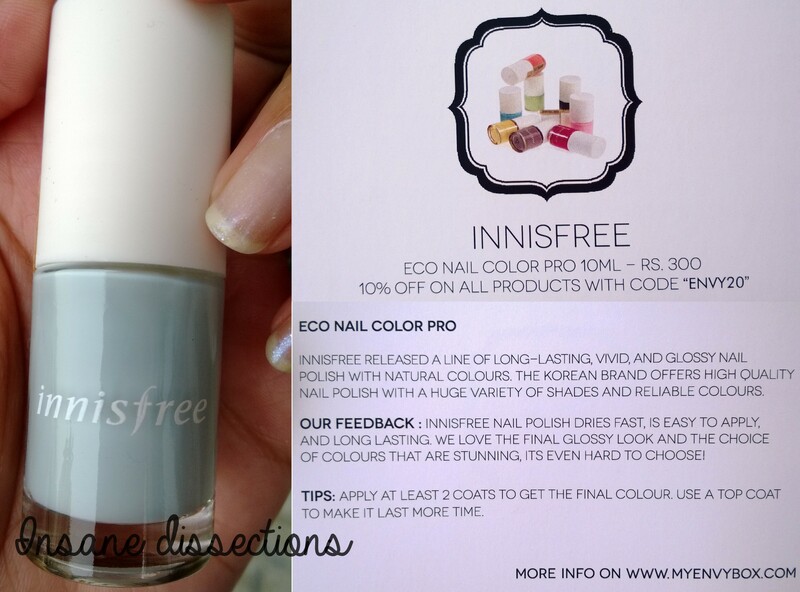 The Nina Ricci perfume and the full size Innisfree nail polish are my best products in this month’s Envy Box. 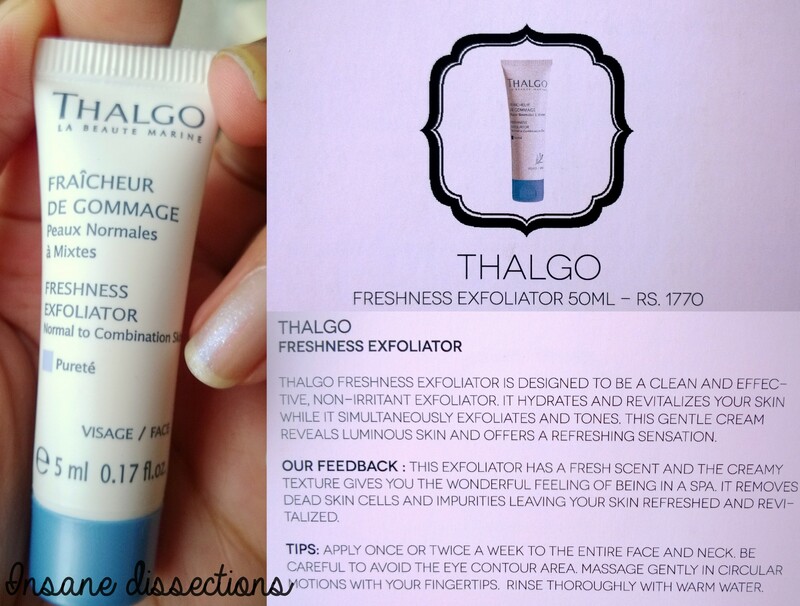 The quantity of all the products in this month’s box are decent except the Thalgo exfoliator. They give useful cards along which gives the info about the name, price for full size product and description of the product. 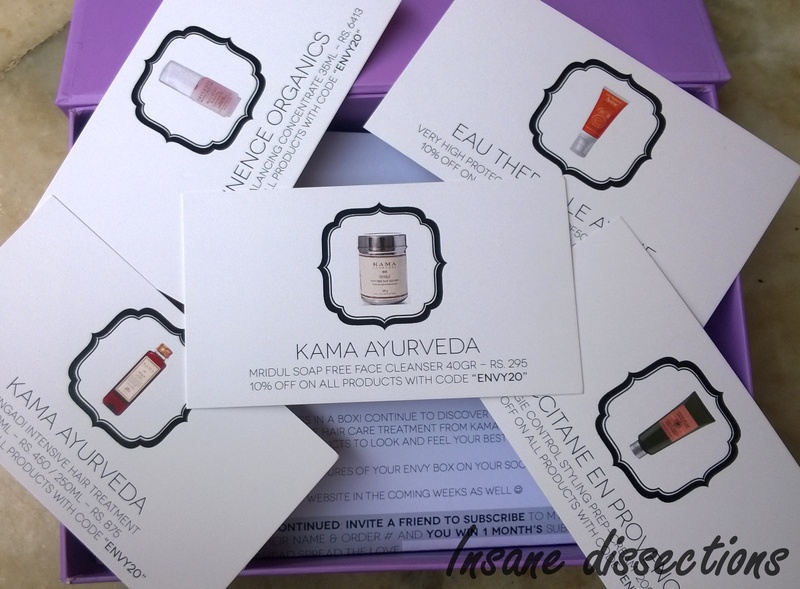 If you buy the full size version of any of the product sampled in this month’s Envy Box, you can avail 10% discount.